Elsewhere on our website, we talk about truck accident cases against Northland Insurance. Below are settlements and verdicts involving Northland Insurance where the plaintiff prevailed. This list, albeit incomplete, suggests that Northland is familiar with large numbers in truck accident cases and generally seeks to avoid trial in these cases. In some of the exceptions below, they got burned when they did not reach an out-of-court Settlement. 2016, New York: $400,000 Settlement. A 63-year-old woman is a passenger in her husband's car and they are traveling on the interstate. Defendant, operating a tractor-trailer, sideswipes their vehicle, knocking it off the road and into a tree. The woman suffers injuries to her back, foot, knee, neck, and toes. She brings a case against defendant driver, insured by Northland, alleging that he merged into her lane. During arbitration, the woman was found to have sustained serious injuries, and was awarded damages of $400,000. 2016, Georgia: $110,000 Verdict. A 23-year-old student is traveling on a two-way highway in the left lane. Suddenly, the passenger side of his vehicle is struck by defendant's tractor-trailer. He sustains injuries to his shoulder and back. He brings a claim against the truck driver, his company, and their insurance carrier, Northland Insurance Company. A jury awarded the student $53,920 for medical expenses and $56,080 for pain and suffering. 2014, California: $3,500,000 Verdict. Defendant is operating a Freightliner when he hears a noise coming from the transmission. He leaves his truck after his dispatcher advises him not to drive it further, and he contacts plaintiff, who was traveling a similar route. Plaintiff shows up in a different truck, and helps defendant make his deliveries. They then pick up the truck that defendant left at the truck stop and drove it 250 miles. Defendant agreed to complete the deliveries, while plaintiff agreed to take defendant's truck. Plaintiff drove defendant's truck, but a transmission leak caused a fire under the cab of the truck, engulfing the truck fully in flames. Plaintiff was found covered in burns in the sleeping compartment of the truck and deceased. His wife filed a wrongful death claim. A jury found defendant to be negligent, but also found that plaintiff decedent should have inspected the truck. The jury held decedent 15% liable and defendant 85% liable, and awarded the decedent's Estate $3,500,000. After apportioning fault, the total recovery to the family was $2,975,000. 2014, Wisconsin: $1,023,600 Verdict. A 69-year-old is driving semi-truck for work when he is rear-ended by defendant driver and injures his back. Plaintiff is insured by Northland Insurance at the time of the accident. He brings a claim against defendant driver and defendant's insurance company, as well as his own insurance company. A jury awarded him $50,000 for pain and suffering, $41,100 for medical expenses, $7,500 for future medical expenses, and $925,000 for loss of earning capacity. 2014, California: $1,000,000 Settlement. A 79-year-old woman is attempting to cross the street in, or near, a crosswalk. Defendant, attempting a right hand turn at the same intersection, strikes the woman and kills her. The defendant truck driver was insured by Northland Insurance at the time. Her Estate brought a claim against the truck driver, alleging that he should have seen her and yielded to her. During settlement negotiations, the defendants admit that the driver was focused on oncoming traffic to his left, instead of looking to the right where plaintiff was crossing the street. The parties settled for $1,000,000. 2014, Nevada: $58,000 Settlement. A two-year-old passenger is in a vehicle when it gets into an accident. Her grandmother files a case on her behalf, against defendant driver and his insurance company, Northland Insurance. Northland agreed to settle the case for $58,000. 2013, California: $400,000 Settlement. Plaintiff, a taxicab driver, is in the right turn lane when defendant's vehicle attempts to enter the same lane but sideswipes plaintiff's vehicle. Plaintiff alleges a back injury from the collision, costing him $120,000. Defendant, insured by Northland Insurance Company, agreed to settle the case before trial for $400,000. 2013, Georgia: $375,000 Settlement. A 66-year-old hairdresser is driving her vehicle when she enters an intersection. At the same time, defendant's vehicle also enters the intersection, striking her vehicle and causing it to roll over multiple times. She sustains clavicle and finger fractures. Defendant driver, insured by Northland Insurance, agreed to settle the woman's claim for $375,000. 2012, Oregon: $551,314 Settlement. A 69-year-old plaintiff is driving a limousine when it is impacted by defendant driver who attempts an improper lane change. Plaintiff's vehicle is knocked off the roadway and he injures his back. The injuries are severe and require three surgeries. The defendant's insurance company, Northland, agrees to settle the case during arbitration for $551,314. The plaintiff is also later awarded $177,000 in attorney's fees, which the defendants appealed. 2012, Wisconsin: $200,000 Settlement. Plaintiff is operating a tractor trailer as he approaches an intersection controlled by traffic signals. Defendant driver is also approaching the intersection from a side street, and he attempts to turn right onto the road plaintiff is traveling on. However, he strikes plaintiff's vehicle. Plaintiff suffers a tear of his left shoulder which requires surgery, in addition to a disc bulge in his cervical spine. He files a claim against defendant and defendant's insurer, Northland Insurance, arguing that plaintiff ran the red traffic signal and pulled into his lane of travel. The defendants denied liability, but settled the plaintiff's claim for $200,000. 2010, Oregon: $705,000 Settlement. A 64-year-old male is driving on the highway. At the same time, defendant, driving an eighteen-wheel semi-truck, crossed into plaintiff's lane struck plaintiff's vehicle, allegedly pushing it 100 feet away from the collision site. The plaintiff fractured his wrist requiring surgery, as well as his ankle which also required surgery. Plaintiff also sustained an injury to his right lung in the collision. Defendant driver argued that plaintiff crossed into his lane and was responsible for the collision. Defendant, insured by Northland, agreed to settle the case for $705,000. 2010, Texas: $450,000 Settlement. A 33-year-old male is driving his pickup truck when defendant is driving an eighteen wheeler for work. Defendant attempts to change lanes, but sideswipes plaintiff's vehicle on the passenger's side. The man claims he injured his neck and spine during the accident. The plaintiff sued defendant driver and his insurance company, Northland Insurance, for negligence. The defense alleged plaintiff was the one who made the unsafe lane change. During mediation, the parties settled for $450,000. 2009, Nevada: $738,167.30 Settlement. A 19-year-old man is driving his car on the highway when a Freightliner tractor, pulling another trailer, traveling behind him, strikes his vehicle. This causes the 19-year-old's vehicle to overturn, go into an embankment, and finally come to a rest on the opposite shoulder. The man is airlifted to the hospital but is pronounced dead. Defendant driver was issued a warrant for several violations, including driving for extended hours. The report stated that defendant driver was fatigued or fell asleep at the time of the collision. The man's estate brings a claim against defendant driver and the owner of the truck, whose insurance carrier, Northland Insurance, agreed to settle the case for $738,167.30. This was in addition to the almost $12,000 it had previously paid for property damage to the plaintiff's vehicle. 2009, Texas: $400,000 Settlement. A 43-year-old woman is sleeping in the cab of her husband's eighteen-wheeler while it is parked at a truck stop. Another eighteen-wheeler had just filled his fuel tank up and was pulling away from the gas pumps, when defendant driver makes a right turn and drags his trailer across the front of plaintiff's cab. The impact alleged knocks the woman to the floor, injuring her head and neck, resulting in a cervical herniation requiring surgery. She brings a claim against defendant driver, arguing that he did not keep a proper lookout. Defendant, insured by Northland, did not argue liability but alleged that the impact was minor and not the cause of the woman's medical issues. During mediation, the parties settled the case for $400,000. 2009, Wisconsin: $333,617.23 Verdict. Plaintiff's vehicle is suddenly struck by defendant driver resulting in injuries. Defendant driver, insured by Northland Insurance Company, was working at the time of the incident. Plaintiff filed suit against defendant driver, the company he was employed for, and his insurer Northland, who all argued that the plaintiff failed to mitigate his damages. A jury awarded the man $200,000 for pain and suffering, $1,326.66 for lost wages, and $132,344.57 for medical expenses. 2009, Wisconsin: $333,400 Verdict. Plaintiff is operating his pickup truck when he is struck from behind by a tractor-trailer, operated by defendant and insured by Northland Insurance Company. The plaintiff files a claim against the driver and the insurance company, arguing that he operated his truck negligently and failed to keep a clear distance. A jury awarded the plaintiff $333,400, but this award was later reduced to $185,000 due to a high/low agreement. 2009, California: $125,000 Settlement. A 45-year-old plaintiff is crossing the street in a crosswalk when defendant attempts a left-hand turn but strikes him. The plaintiff suffers injuries to his lower back and left leg as a result of the impact. He sued defendant driver as well as the owner of the limousine defendant was driving. Both were insured by Northland Insurance Company at the time of the accident, who settled the pedestrian's claim during mediation for $125,000. 2008, Texas: $5,600,000 Verdict. A 17-year-old is driving a minivan after dropping his mother off at work. Shortly after, his vehicle is hit head-on by an oilfield services truck, owned by defendant company and driven by defendant driver, insured by Northland Insurance. The 17-year-old is killed instantly upon impact. The defense attempted to argue that the plaintiff had moved into the northbound lanes. A jury found defendant was negligent, and awarded the man's estate $2.1 million to his widow, $2.1 million to his daughter, and $1.4 million to his mother. 2008, Texas: $775,000 Settlement. Plaintiff is operating his vehicle when defendant, operating an eighteen-wheeler, crosses over the center line and strikes his car. Plaintiff sustains a lacerated scalp, several herniated discs in his back, and a broken nose as a result of the impact. Defendant is insured by Northland Insurance at the time. A jury found defendant driver 100% liable and awarded plaintiff $775,000. 2008, Texas: $550,000 Settlement. A 39-year-old is driving an eighteen-wheeler on the highway in the right lane. Defendant, also operating an eighteen-wheeler, was traveling in the left lane. Defendant suddenly attempts to turn right into a truck stop and collides with plaintiff's truck. Plaintiff claims that the accident caused a prior injury to his neck to return, in addition to new herniated discs in his spine requiring surgery. Additionally, he argues he will be unable to work as a truck driver again. Plaintiff files claims against defendant and defendant's insurer, Northland Insurance, for negligence due to making a right turn from the left lane. Defendants argue that plaintiff was speeding, which plaintiff admitted to during his deposition. The parties settled for $550,000, which just over half of the policy limits that were held by Northland Insurance. 2007, Illinois: $1,964,984.31 Settlement. Plaintiff is driving his vehicle through an intersection on a green light. At the same time, defendant's vehicle, hauling either concrete or gravel, traveled through the intersection on a red light. The vehicles collided, and plaintiff died as a result. Plaintiff's mother brought a claim on his behalf, alleging the defendant driver failed to obey a red traffic signal and that the truck owner failed to keep the vehicle safe. Rockford Insurance and Northland Insurance agreed to a settlement totaling $1,964,984.34. 2006, California: $618,675 Settlement. Plaintiffs, seventeen tourists and one tour guide, are traveling on a tour bus from Arizona to Las Vegas. The bus driver of their bus slows down due to a glare from the sun, when the bus is struck from behind by a freight truck. This causes the bus driver to lose control of the vehicle, resulting in the bus striking a rock embankment on the opposite side of the road. The plaintiffs were all transported to the hospital, and sustained a variety of injuries including to their neck, back, chest, ribs, shoulders, legs, fingers, hips, teeth, and abrasions. The freight liner was insured by Northland Insurance Group, who agreed to settle the cases for $618,675. 2006, New Jersey: $500,000 Settlement. A 70-year-old chaplain is driving his car when defendant's tractor-trailer collides with him in an intersection and strikes his vehicle on the driver's side. The man dies at the scene of the accident, while defendant driver attempts to leave the scene. The police stop him, charging him with death by auto. The chaplain's estate, his wife and eight children, bring a claim on his behalf, alleging the truck driver ran a red light. Defendant driver, insured by Northland Insurance Company, agreed to settle during mediation for $500,000. 2001, Wisconsin: $666,000 Settlement. A 29-year-old dentist is driving his car when defendant's tractor-trailer, traveling in the same direction, attempts to change lanes but strikes his vehicle. The dentist sustains mild brain injuries as a result of the collision. Before trial, the defendant's insurer, Northland, agreed to settle for $666,000. 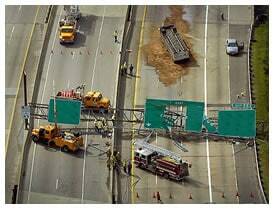 At Miller & Zois, our truck accident lawyers have handled many serious injury and wrongful death cases. Our focus is Maryland. But our lawyers have handled cases in most states in this country. We handle severe injury and wrongful death trucking cases throughout the United States. We have a history of getting results. You can see them at the top of this page clicking on the verdicts and settlements bar. We fight these cases like they are the Super Bowl to maximize the value for our clients, using every possible weapon in our arsenal to apply beginning to end pressure on trucking companies to pay what they should in these cases. Call us at 800-553-8082 or get a free evaluation online.